If you’re seeking an enthralling day’s sport while enjoying a delightful and exclusive countryside setting, The Huntroyde Estate in Lancashire has the perfect answer. Our simulated game shooting and clay pigeon shooting days offer a wonderfully sociable experience in a completely private, licensed, shooting ground. We take care of all the details, leaving you free to sample the excitement and anticipation of realistic game shooting to the full. Set in an area of outstanding natural beauty and surrounded by mature deciduous woodland, the shooting ground is kept as natural as possible to give you a feel of a true day in the country. Whether you’re after serious shooting practice during the closed season or an opportunity for hospitality with friends, colleagues or guests, we can tailor a game or clay pigeon shooting package to your exact needs. 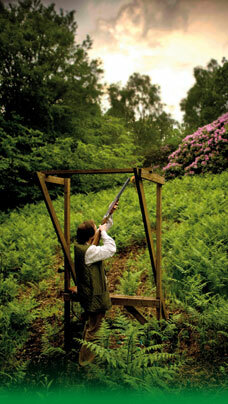 The Huntroyde Estate enjoys a secluded location in the Forest of Bowland. This area of outstanding natural beauty provides a delightful backdrop to our very private simulated game shooting and clay pigeon shooting ground and you will have exclusive access to the facilities.